At an unspecified time in the past, Yaz and her family are celebrating her Nani’s (grandmother’s) birthday. She gives Yaz, her favorite granddaughter, a broken watch that belonged to Yaz’s grandfather but won’t provide any detail about the watch beyond that. Now in the TARDIS, Yaz persuades the Doctor to take them to visit her grandma when she was younger and the Doctor reluctantly agrees, so long as they don’t interfere with anything. Yeah, because that’s always worked out well before. Pretty soon after landing in 1947 Pakistan, the Doctor has a telepathic flash of strange-looking aliens. There’s no choice but to investigate. 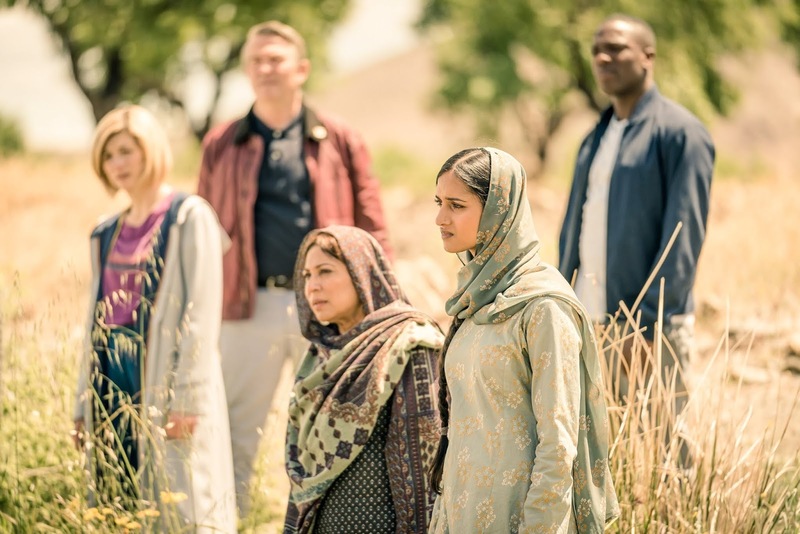 The team encounters a man in a cart who seems to know Yaz’s grandma, Umbreen, and agrees to take them to see her. He greets a holy man also walking along the road as they leave. Arriving at Umbreen’s house, the TARDIS Team claims to be distant relatives and family friends but right away Yaz notices a problem. The man who brought them, Prem, is Umbreen’s fiancé — but he’s not her future grandpa. Then again, he’s wearing the watch. Did her Muslim grandma have a secret Hindu first husband? In addition to being the day of Umbreen’s wedding, it’s also the day of Partition, when India is divided into India and Pakistan. The Doctor knows this will cause intense violence and millions of deaths too. Prem’s younger brother, Manish, is all for the division. He even creates a border with a piece of rope to show where Umbreen’s family, who are Muslim, “belong” in Pakistan and where his family, who are Hindu, “belong” in India. The Doctor gets a long psychic flash of the aliens and runs into the forest, where she and the team find aliens crouched over the dead holy man from the road. Prem shoots at the aliens but they teleport away. The holy man is covered in a weird purple dust. Prem reveals he’s seen the “demons” before, during the war. When he went searching for his older brother, he saw the aliens standing over his body. Prem, the Doctor, and Ryan stumble upon a doorway to a spaceship. Inside, the Doctor learns the aliens are Thijarians — well-known deadly assassins. When she grabs a canister of the purple dust that was covering the holy man’s body, the Thijarians are summoned back to the ship. She’s able to use the sonic to get herself and the two men to safety, though they get split up in the process. They all meet — along with Umbreen and Prem’s families — in Prem’s barn. The Doctor uses the Thijarians’ mini teleporters to create a temporary barrier around the property. Manish as well as Umbreen’s mom, who has opposed her daughter’s marriage from the start, think the aliens were summoned because of the impending union. Umbreen is unmoved; Prem is the one certainty in her life, she says. She proposes they get married first thing in the morning. The men and women separate for the night. The four ladies, the Doctor included, chat around a fire. Umbreen reveals her family and Prem’s have always worked the land alongside one another. She and Prem grew up together. The holy man who died was supposed to perform the wedding ceremony so instead, Umbreen asks the Doctor to do it, and she agrees. The stag night goes less pleasantly. Manish and Prem argue over a Hindu marrying a Muslim, and the younger brother storms out. That night, the Thijarians break through the force field and take the Doctor back to their ship. There, they show her how their homeworld was destroyed and they decided to give up their assassin lifestyle in favor of traveling throughout time and space to honor the unacknowledged dead. They are staying near Prem because tomorrow on his wedding day, he’s going to die alone. The Doctor asks about the holy man and they show her how he died, though we don’t get to see. She returns to the barn and tells the team what she’s learned. Yaz is heartbroken for her grandma and doesn’t want to leave until she can be sure Umbreen will be okay. The others agree to stay as well. In the beautiful morning light, the Doctor performs the wedding ceremony at Manish’s makeshift border. She sonics off the rope but Umbreen picks it up. With Yaz’s help, she binds together her hands and Prem’s in the Hindu tradition. From a distance, Manish watches hatefully. He returns to the barn during the reception, where Umbreen tries to honor him for working the land during the war and helping to keep her family alive. He shirks her praise and before storming out again, saying he wishes Prem had died in the war rather than return and disgrace their family by marrying Umbreen. Determined not to let his brother spoil the day, Prem gives Umbreen his watch, though he drops it on accident, breaking it. Umbreen reassures him — this is now their moment in time forever. The Doctor follows Manish and confronts him just as he grabs Prem’s rifle from the war. She knows he killed the holy man. Manish tells her to leave with her friends if she wants to live. Armed men are on their way to enforce the new border. Umbreen and her mother race to gather essentials from their home. Then, Prem sends them into the forest while he goes out to confront Manish and the men on horseback. He walks forward alone. He recognizes one of the men as someone he served alongside in the war. Team TARDIS runs into the forest, but Yaz stops to watch. The Thijarians arrive and promise to watch over Prem. Yaz and the others continue to run as Manish rejects his brother’s attempt at peace and one of the armed men shoots Prem. Back in the present, Yaz visits with her grandmother. Where before Yaz had pressed for the story of her grandfather’s watch, now she says she’s fine to wait until another time to hear it. Season 11 is turning into a massive history lesson and I love it. 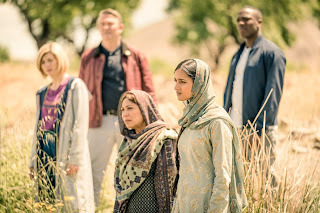 I’m sure there are critics and viewers complaining that the show is too political but Doctor Who has always been at its most profound when it reflects the issues we face in contemporary life. Every “political” message has been spot on. I was critical last week that none of the bad guys this season have faced any consequences from their behavior, especially when that behavior has almost always resulted in people dying. I stand by that criticism, but I also acknowledge that in many episodes this season, the true “villain” is a social problem such as racism, prejudice, or greed. It’s a lot harder to punish those kinds of villains, but I do appreciate how much the show drives home the point that love, compassion, unity, and acceptance are always stronger.